Before you choose what Massage course you are going to undertake, it’s important to know everything the best course should cover – so that your massage training gives you the extra skills required to fix pain. Most Massage Courses out there won’t do this! So what do you need to look for? One massage course isn’t the same as another and finding out the facts before you spend lots of your time and money is the only smart way to approach your massage training. Similarly if you have already completed your massage training, it is important to find out what you haven’t been taught yet so that your continuing professional education dollars can be spent doing the extra training that will make you an expert at fixing pain. The information you need is contained in a FREE book written by a professional, highly experienced, therapist and you can download it right now. Reading this book, covering everything that is important about a massage course and being able to effectively fix pain. It will make your massage training or continuing professional education decisions much easier. And what any good massage therapy training course should cover. Download your FREE e Book Right Now! Your detalis will never be shared with any third party, ever. What any good Massage Therapy or other Bodywork course MUST teach you to do. Why most massage therapists fail to get lasting results when treating chronic pain. How to use your massage training to fix all types of pain quickly and effectively. Things your remedial massage training should incorporate that that most massage courses don’t. Things you can immediately add to your massage skills, to increase your success from tomorrow. Expert advice on how to massage someone with Back Pain, Shoulder Pain or Knee Pain. This new e-book, ‘Using Massage to Effectively Fix Pain’ contains previously unseen information you can add to your massage training IMMEDIATELY to boost the success you are achieving with your clients. What you learn from most massage courses won’t be complete until you know this information. And if you are considering a remedial massage course, the information will guide you into making a better decision on the right massage training to undertake. By filling in the form below you will be sent an email explaining where you can instantly download your FREE copy. 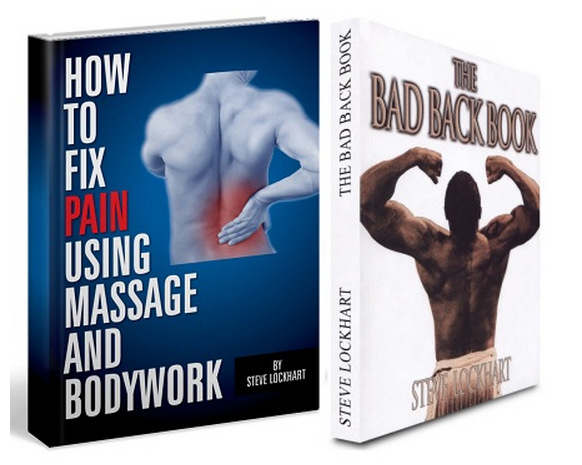 BONUS BOOK you will also get access to a FREE copy of ‘The Bad Back Book’ containing over 60 pages of facts and information that will help make you an expert at understanding and treating back pain and sciatica. It’s also information that your previous massage training won’t have taught you but that every therapist should know. Also lots more valuable tips and information to help make you a much more effective therapist will be emailed to you when you sign up for Steve’s FREE books below. Please don’t be concerned at giving us your contact details as we will never, under any circumstances, share them with any third party. Also you can take your name off our mailing list at anytime with a click of your mouse. Thank you for sending me this material. I am a retired osteopath. I am seventy five and had not intended to retire but did, and I am not now in a position to do any more courses. I only wish I had met you thirty years ago! Regarding your book: it would be of considerable interest to most people, both general public and prospective students. You obviously have a deep knowledge of the entire field and it is good that people like you are taking over from both orthodox medics as well as from some alternative therapists. I therefore wish you the very best of success in all that you are doing. By the way, I live in Asia. I had my first paying patients today. One was a lady with apparently L4L5 injury from 7 years ago along with hamstring tear. The previous 2 years she has been in constant pain. For 2 years she has been on pain killers and anti inflammatories. Been to chiro, osteo, physio, acupuncture. not one provided relief. I wasn’t expecting the transformation in tissue like I saw. It’s still a.shock for me. She got off my table. NO pain. I believe a guy Craig may have written to you a few weeks ago about me. He had explored all avenues for dealing with his sciatic pain and found SLM on the web. He contacted me off the practitioner’s list on the SLM website. He was on the verge of “exploratory surgery” and deferred that while he looked for inspiration in the web. When I saw him first he was on 7-8 of a scale of 10 for pain, could barely cope with work and to scared to hold his baby in case his legs gave out & he collapsed on her. 1st treatment pain dropped to 3/10. 2nd treatment pain dropped to 0-1/10. He is thrilled, as am I.
I have had several similar miraculous results and he has promised me a testimonial. So progress has been good. I’m very happy with SLM generally, and the course has been excellent. I am truly amazed with the results that SLM produces in people. I’m SO glad that I stumbled onto your web site and took the plunge to study your methods. I can’t wait to continue with the case studies and become the ultimate therapist! Results like this is why I started doing complementary therapies in the first place.